TS Schools Summative 2 Annual Exams 2019 New Time Table: TS SA 2 Annual Exams Time Table, TS SA II Exams 2019, TS Summative II Exams 2019 Time Table, TS Annual Exams 2019 Time Table for Primary, UPS and High Schools, The schedule for the valuation and issue of the Cumulative Records: The DSE and SPD, SCERT Telangana has announced the SA II Annual examination Time Table for Telangana State Schools. In this announcement Summative Assessment II starts from 30.03.2019 to 09.04.2019. These exams will be held from 9.30 AM to 12.00 Noon for Classes I to V; 10.00 am - 12.45 noon for class VI and VII; 2:00 pm to 4:45 pm for class VIII; 10.00 am - 12.45 noon and 02.00 pm - 04.45 pm for class IX and the new time table is as follows. Academic Calendar and implementation of curriculum, Conducting of annual examinations (SA-II) from 7th to 14th March, 2019 to facilitate smooth conduct of examinations under invigilation from the teachers and correction of answer scripts, declaring the results in all Government, Government aided and private schools. Detailed instructions have been issued on the implementation of Academic Calendar for the academic year 2017-18 and instructions have been issued for conducting SA-II examinations from class I to IX and also instructions on preparation of class X students. In this regard, the annual examination (SA-II) from classes I to IX shall be conducted from 30.03.2019 to 09.04.2019 in all Government, Government aided and private recognized schools. Following is the schedule for the conduct of the SA-II examinations. Subject: SCERT, Telangana, Hyderabad - Revised timetable of Summative Assessment (SA)-II for classes I to IX for the academic year 2018-19 - Reg. 1. Press Note, Rc.No.152/B-2/2018, dt: 05.03.2019 of the Director of Government Examinations, Telangana, Hyderabad. The attention of all the RJDSEs and DEOs in the State is invited to the subject and reference cited above. Due to the Biennial Elections to the Telangana State Legislative Council scheduled on 22.03.2019, the Director, Director of Government Examinations, Telangana, Hyderabad has given the notification regarding the postponement of one paper of the SSC Public Examination, March 2019 scheduled on 22.03.2019. The date of English Paper-II falling on 22.03.2019 has been postponed to 03.04.2019, which is clashing with the Summative Assessment (SA) II on 03.04.2019. Keeping in view of the above examination dates, the Summative Assessment (SA) II for classes I to IX for the academic year 2018-19 are revised from 03.04.2019 onwards. The revised timetable is as follows. In this regard, the following instructions are to be followed for conduct of SA-II and other procedures. Therefore, all the DEOs are informed to give necessary instructions to the schools on conduct of Summative Assessment (SA) II for classes Ito IX as per the revised time table. All the MEOs are hereby instructed to present themselves round the clock to receive the question paper bundles of SA II at their respective MRCs on 22 & 23 of March 2019 Soon after receiving the bundles. 1) Check all the bundles and record the details in Stock Register. 2) Make bundles from classes l-V according to the requirement of the schools strength wise and subject wise and Distribute them to the Primary Schools on 25 & 26 of March 2019 . MEOs of respective mandals should pay sudden and surprise visits to randomly selected schools of all managements during the Examinations and submit the report to the Secretary , DCEB. Rs. No. 843, DSE Telangana: Sub: School Education, Tclangana, Hyderabad - Rescheduling of Summative Assessment Examinations (SA·ll) from 30.03.2019 to 09.04.2019 - Communication of Revised Schedule - Orders Issued - Reg. All the RJDSEs, DEOs arc hereby informed that, vide reference cited, the schedule for the conduct of Summative Assessment II (SA2) examinations have been communicated scheduled from 30.03.2019 to 09.04.2019 for all the schools in the State as per the academic calendar. All the DEOs are directed to take necessary action on the above and inform the revised schedule to all the Head Masters in the State including private school managements. The District Educational Officers are directed to take all the precautions to conduct exams seriously and confidentiality shall be maintained and see that the conduct of examinations declaring the results, convene parent meeting and issue of cumulative records to all the children, as per the schedule indicated above. The RJDSEs must monitor activities in all the Districts and submit district wise report to the Director of School Education. SCERT Telangana - Sub:- SCERT, Telangana, Hyderabad - Communicating examinations schedule of Summative Assessment II for classes I to IX and pre-final examinations for class X- Orders issued - Reg. All the District Educational Officers in the State are hereby informed that as per Academic Calendar communicated, the Summative Assessment (SA)-II is scheduled from 2nd to 9th April, 2019 for classes I to IX and the pre-final exams for class X from 16th to 28th February, 2019. 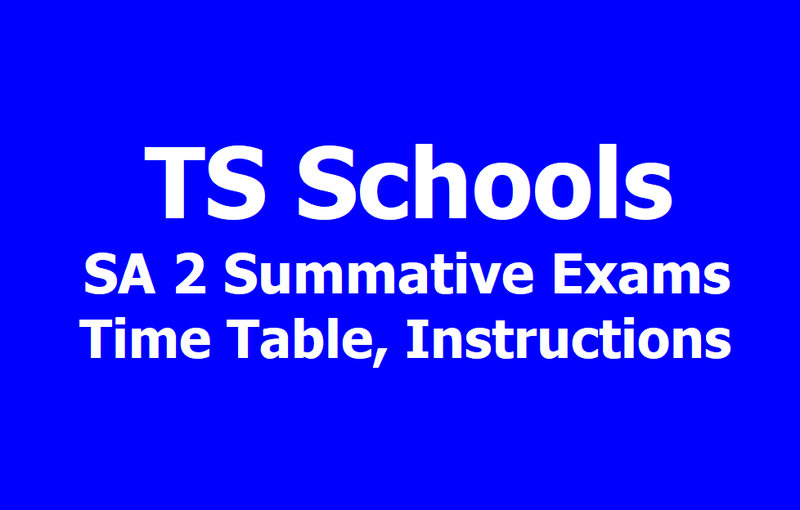 In this regard, time tables are communicating with instructions for conduct of Summative Assessment (SA)-II and Pre-final examinations and valuation of answer scripts.. Therefore, the DEOs are requested to give necessary instructions to the schools on conduct of Summative Assessment (SA)-II, valuation of answer scripts and issue of Cumulative Records which shall be completed in all aspects. 1. SA 2 Exams : 30.03.2019 to 09.04.2019 and 09.04.2019: Conduct of SA-II for classes VI to IX in the morning session. 3. Recording results and parents meeting on 11.04.2019 and issue the progress report to children. 4. Students resubmit the progress report to school after parents signature - 12.04.2019. i.e Resubmitting of the Cumulative Records by students after parents signature. Conduct of Summative Assessment Examinations (SA-II) from 30.03.2019 to 09.04.2019: All the RJDSEs, DEOs are hereby informed that, vide reference cited, the draft question papers developed at the Districts have been discussed in the State Level Workshop by the subject experts and edited and finalized. The finalized question papers have. been handed over to DCEB Secretary pertaining to the Districts for under taking printing and conduct of School Assistant-II examinations. The District Educational Officer are requested to verify the edited question papers and take up the printing as per the procedure in vogue. The District Educational Officers of the erstwhile districts are requested to take up the printing of the question paper for all the New District formed in the main District. A set of the printed question paper shall be submitted to Director SCERT in a sealed cover without fail. Vide reference 3rd cited, orders have been issued for the conduct of Pre-Final examination from for class X by 27-02-2019 along with daily schedule. As per the academic calendar the schedule for the conduct of Summative Assessment (SA-II) examination will be from 30.03.2019 to 09.04.2019 for classes I to IX. Therefore, the schedule for conduct of the Summative Assessment (SA-II) i.e., from 30.03.2019 to 09.04.2019 is given here under for classes I to IX. Note: The Examination duration for 2nd Language paper/or both Hindi & Telugu for classes IX & Xis for 3 hours in view of single paper. During the examination period i.e. from 30.03.2019 to 09.04.2019 the answer scripts must be valued and Cumulative Records shall be completed in all aspects by 10.04.2019. The schedule for the valuation and issue of the Cumulative Records etc., is given here. All the DEOs are directed to take necessary action on the above and conduct exams seriously and confidentiality shall be maintained and see that the conduct of examinations declaring the results, convene parent meeting and issue of cumulative records to all the children, as per the schedule indicated above. The RJDSEs must monitor activities in all the Districts and submit district wise report to the Director of School Education without fail. In case of any clash with the High Schools where Intermediate exams are being conducted, the DEOs are requested to take up alternative strategies/ schools and conduct the exams as per the schedule. Previous year instructions: The assessment of co-curricular activities must be taken up as per the instructions given under Continuous and Comprehensive Evaluation (CCE). The Handbooks may be referred for undertaking assessment. In case of Class X, the assessment of co-curricular activities shall be taken up along with 4th Formative Assessment [FA] so as to upload the internal marks of FA and co-curricular activities to the SSC Board. In case of Pre-final exams, instructions have already been issued to use second set of SSC question papers pertaining to except English and Hindi papers. In view of certain changes in the questioning pattern, the schools are requested to develop their own Pre-final papers in case of English and Hindi. The changes have already been communicated in present SA-II papers of class IX which reflects the model of class X question papers. Instructions have already been issued by the Director of School Education for the inspection of internal assessments i.e. Formative Assessment in terms of conduct of the Formative Assessments and awarding the marks by sending a team of experts with Headmasters and subject Teachers under the supervision of concerned Deputy Educational Officers to all types of schools both Government and Private Managements and certify the correctness of awarding the marks based on the quality of the students’ records/ works. The marks may be uploaded to the SSC Board after certifying the internal marks by the concerned teams. The State Teams shall be visiting the schools shortly and observe the award of internal marks and certification by the expert inspection team. The indicators for the awarding of marks for internal examinations are enclosed. However, this was already given in the Teacher Handbooks and discussed in the training programmes and subject-wise teleconference programmes. During the examination period i.e. from 30.03.2019 to 09.04.2019, the answer scripts must be valued and Cumulative Records shall be completed in all aspects. Answer scripts to Parents through students for their examination and for signature on 10.04.2019. The valued answer scripts must be given to the children on 10.04.2019 and discuss the answers in the classrooms. The answer scripts must be given to the children so that they can show to their parents and get signature of the parents on the answer scripts. Meeting with Parents to discuss the progress and issue of Progress Reports (Cumulative Records) : 20th March 2019. So, the final results shall be declared and Cumulative Records (Progress Cards) must be issued to the children on 10.04.2019 duly convening a meeting with parents and SMC members in the school premises. 6- Issue of Cumulative Records: *The children obtain signature on Cumulative Records and return back Cumulative Records to the concerned Teachers/ Headmasters 11.04.2019. The teachers must collect the Cumulative Records/ Progress Cards from the students and keep in schools. However, the Cumulative Records pertaining to passing out students of class V and class X shall be issued to children by completing the records in all aspects and shall not be taken back. 7. Next academic year 2019-2020: The syllabus for the next academic year shall be commenced from 1st June, 2019 onwards and the syllabus shall be taken up as per the syllabus distribution in the academic calendar in the months of March and April for the year 2015-16 along with recapitulation of earlier class concepts. Remedial teaching: Remedial teaching for the children who are backward in reading, writing and arithmetic shall be taken up without fail. In this case, children may be asked to tell names of the different articles, words, small stories and teacher must write this on the blackboard and make all the children to read and write the words and texts written on the blackboard. All schools shall take up the programme for the children who are unable to read and write and do arithmetic duly following the language and Maths exercises given in the class I to III textbooks. However, detailed guidelines will be issued in this regard on recapitulation and remedial programme. Registers and Records: All the Registers and Records must be completed and final Consolidated Register proforma shall be submitted to concerned MEOs and School Complex Headmasters in case of Primary Schools and to the Dy.EOs in case of High Schools by the concerned school Headmasters. Therefore, all the DEOs are requested to take necessary action and conduct the exams as per the timetable given above in all types of Schools under Government and Private Managements in a serious manner and see that all schools and Teachers complete all Registers and Records and declare the results and provide Progress Cards (Cumulative Records) to all the children without fail as per dates given above. The MEOs, Dy.EOs and DEOs are requested to take immediate necessary action and inform all the schools about the exam schedule and as well as starting of the academic year from 1st June, 2019 onwards. Degree Final nundi D.Ed Course lo cherithe meeku D.Ed Course ki Fee reimbursement vasthundi..